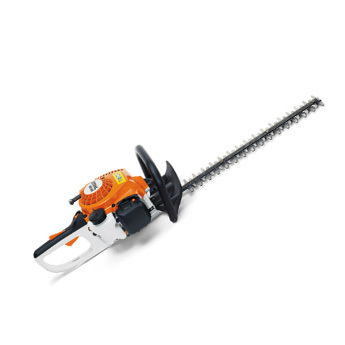 Ideal for light maintenance of hedges, shrubs and bushes in the garden. Light introductory model for garden trimming. With Elastostart for comfortable starting. blade length: 45cm/18"
Dual ground blade system provides a clean cut. Excellent for cutting stronger, thicker branches. This ensures reliable starting and trouble-free running. The ignition system is fully encapsulated and thus protected from damp and dirt. A small fuel pump delivers fuel to the carburettor at the touch of a button. This reduces the number of starting pulls required following extended breaks in operations.